The 13500 Appliance delivers exceptional Next Generation Firewall performance in its class and offers unmatched scalability, serviceability and port density. Benefiting from Check Point's advanced SecureXL, CoreXL and ClusterXL technologies, the 13500 Appliance is capable of delivering stunning performance in a compact 2 rack-unit physical footprint. With up to 23.61 Gbps firewall throughput and 5.71 Gbps of IPS throughput the 13500 Appliance is designed to secure the most demanding network environment. The 13500 Appliance is designed from the ground up for unmatched flexibility for even the most demanding enterprise and data center network environments. 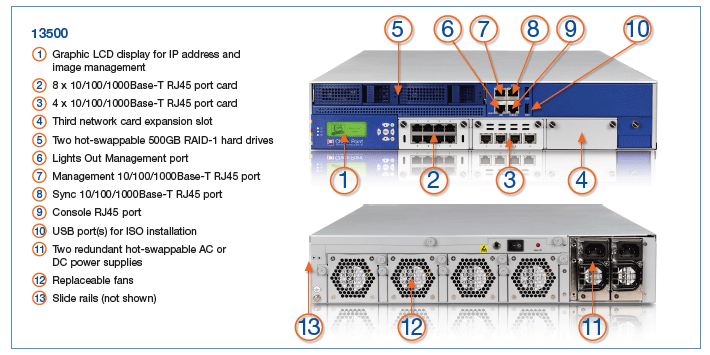 The 13500 Appliance has 3 expansion slots supporting a wide range of network options. The standard configuration includes two onboard 1 Gigabit copper ports for Management and Sync and twelve 1 Gigabit Ethernet copper ports. A maximally configured 13500 Appliance provides up to twenty-six 1 Gigabit copper ports, up to twelve 1 Gigabit fiber ports or up to twelve 10 Gigabit fiber ports. The 13500 Appliances also have hot-swappable redundant disk drives, fans and power supply units. Lights-Out- Management (LOM) provides remote support and maintenance capabilities. Order the appliance with an AC or DC power option to meet your datacenter requirements. 1 SecurityPower Benchmark traffic mix and policy. SecurityPower is a benchmark that measures the capability and capacity of an appliance to perform multiple advanced security functions (Software Blades) such as IPS, DLP and Application Control in real world traffic conditions. This provides an effective metric to better predict the current and future behavior of appliances under security attacks and in day-to-day operations. Customer SecurityPower Unit (SPU) requirements, determined using the Check Point Appliance Selection Tool, can be matched to the SPU ratings of Check Point Appliances to select the right appliance for their specific requirements. The Check Point 13500 Appliance offers a complete and consolidated security solution in a 2U form factor. Based on the Check Point Software Blade architecture, the appliance is available in four Software Blade packages and extensible to include additional Software Blades for further security protection. Customers with high connection capacity requirements can purchase the affordable High Performance Package with the Next Generation security package of their choice. This includes the appliance plus a 4x10Gb SFP+ interface card, transceivers and 64 GB of memory for high connection capacity. The Check Point 13500 Appliances deliver business continuity and serviceability through features such as hot-swappable redundant power supplies, hard disk drives and fans and includes an advanced LOM card for out-of-band management. Combined together, these features ensure a greater degree of business continuity and serviceability when these appliances are deployed in the customer's networks. Check Point GAiA™ is the next generation Secure Operating System for all Check Point appliances, open servers and virtualized gateways. GAiA combines the best features from IPSO and SecurePlatform into a single unified OS providing greater efficiency and robust performance. By upgrading to GAiA, customers will benefit from improved appliance connection capacity and reduced operating costs. With GAiA customers will gain the ability to leverage the full breadth and power of all Check Point Software Blades. GAiA secures IPv4 and IPv6 networks utilizing the Check Point Acceleration & Clustering technology and it protects the most complex network environments by supporting dynamic routing protocols like RIP, OSPF, BGP, PIM (sparse and dense mode) and IGMP. As a 64-Bit OS, GAiA increases the connection capacity of select appliances. Standard (W x D x H): 17.4 x 23.6 x 3.5 in. 1 Maximum R77 production performance based upon the SecurityPower benchmark. Real-world traffic. Multiple Software Blades. Typical rulebase. NAT and Logging enabled. Check Point recommends 50% SPU utilization to provide room for additional Software Blades and future traffic growth. Find the right appliance for your performance and security requirements using the Appliance Selection Tool. 2 With GAiA OS and 64GB memory upgrade. Download the Check Point 13500 Appliance Datasheet (PDF).